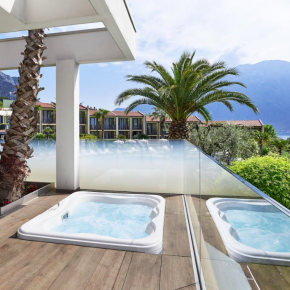 The glamorous Park Hotel Imperial, located in Limone on the shore of Lake Garda, Italy, features glass elements extensively, inside and out, courtesy of two Pilkington products used extensively in the project. The designer of the re-model opted to use Pilkington Optiwhite™ low-iron, extra clear glass and Pilkington Mirropane™ Chrome Plus toughenable mirror. 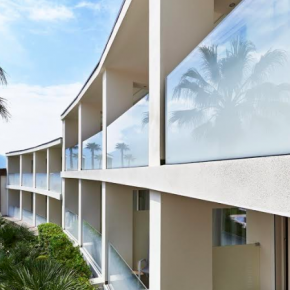 The hotel makes use of glass in the balustrades on the balconies, making up a large portion of the building’s envelope, as well as in many rooms to screen the bathroom from the main living quarters. Much of the glass is used as frameless, laminated panes. When the edges of a thick piece of glass are visible, the colour of the glass becomes especially pronounced, and the natural green tint of standard float glass becomes noticeable. The use of Pilkington Optiwhite™ means the features instead have an almost colourless appearance, lending a cleaner and more contemporary feel to the design. Externally, the balcony glazing is screen printed with a white fade, lending a key design element as well as delivering the right combination of stunning views and privacy for residents. The low-iron glass ensured the white colour of the paint applied to the glass shines out to maximum effect. Elsewhere in the design, Pilkington Mirropane™ Chrome Plus, a toughenable mirror product, was used to integrate mirrored elements. In many suites, the product was etched with leaf and branch motifs and mounted as wall art, backed by a white panel that shows through to create a striking white-on-mirror effect. In the bathrooms, mirrored shower doors give guests privacy, while also serving as a full-length mirror. Because the product can be toughened, which significantly increases its strength, the metal hinges and handles could be fixed directly to the glass, allowing a frameless minimalist look. The mirrors above the sink are also created using the same material, allowing seamless integration with the other glazed elements. Again, the glass was toughened throughout to prevent breakages and protect the safety of the hotel’s users. Pilkington Mirropane™ Chrome Plus also boasts a corrosion-resistant coating, making it ideal for use in a bathroom by helping to prevent the mirror being damaged by frequent exposure to humidity. 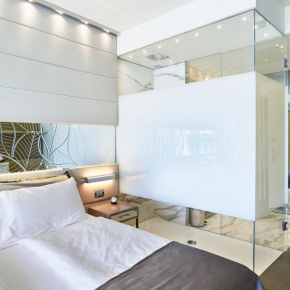 Ulisse Bonesi, manager at glazing specifier Vetraria Bergamasca Tecnovetro, commented: “We chose Pilkington Mirropane™ Chrome Plus because the requirement was for large mirrors that rely on maintenance-free coating rather than reflective backing that can deteriorate over time. 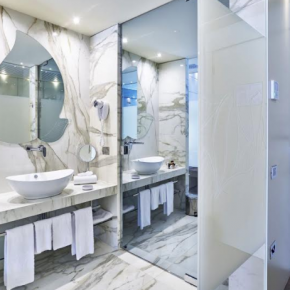 Leo Pyrah, product manager at Pilkington UK, added: “The hotel is a superb showcase for these two products, really demonstrating how high-quality glazing combined with tasteful design can help lend a sense of luxury to a building.